3PA are often asked by prototype companies on how they would mould complex multi shot parts and quote associated equipment. 3PA offered a concept to Pokito which included machine, moulds and twin shot equipment which was way beyond the means of Pokito. 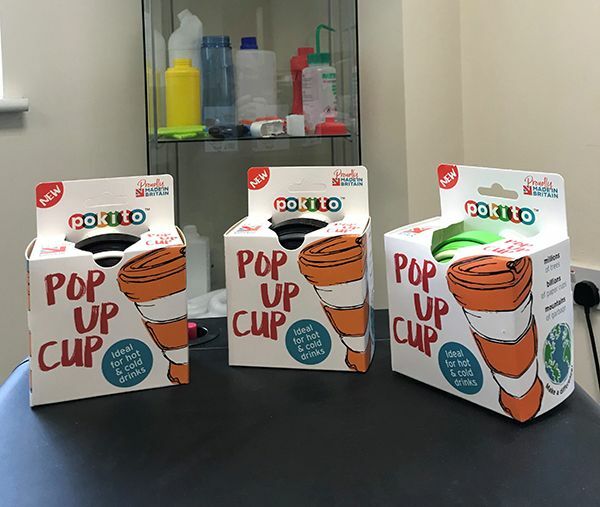 Pokito are a small start-up business who are building on the initial rise of popularity of a new well designed product, but they did not have sufficient funding for the cost of a completely new twin shot cell. Despite this, 3PA continued to talk and discuss the benefits of twin shot over existing slow, expensive, and heavier current production. 3PA introduced Pokito to a mouldmaker and moulding company who were prepared to take on the challenge of not only producing tooling, but also moulding the product in the UK for Pokito. The mouldmaker was well known to 3PA and they had supplied twin shot Plasdan equipment to them previously. It was seen as a twin shot challenge to raise the profile of the mouldmaker to attract more complex mould work and moulding contracts. The product consists of rings of TPE and PP moulded together to form a cup that is collapsible, reusable, with optional volumes and durable. 3PA will be delivering a Plasdan all electric injection unit plus Motan TPE small shot material conditioning and delivery systems to complete the cell in mid-June. For the customer Pokito, it means a significant investment into manufacturing their product in a completely different and innovative way, using the latest technology, bolted on to a standard injection moulding machine. It means lower cost production and higher quality product, all of which can be monitored and controlled at a UK based production facility. For Pokito it will demonstrate to their investors a major step forward in producing the product in a better way, and in greater numbers. Related Post Why Should I Automate My Production Line?